» Text Neck Epidemic. Fix Your Posture in 5 seconds. 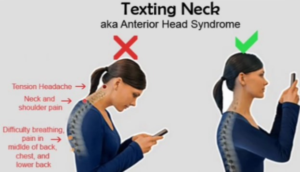 Text Neck Epidemic. Fix Your Posture in 5 seconds. Ever wonder what you are doing to your body just how you orient yourself in space? Just by standing or sitting or lying down incorrectly, there is damage being done to the natural alignment of your body. 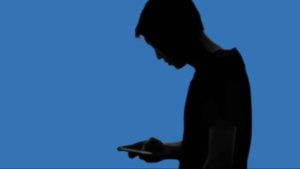 Incorrect postures are very common now as we use a lot of hand-held devices. 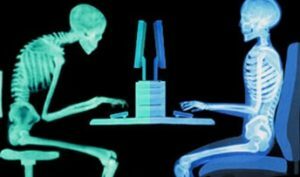 An average person is now spending at least 2-4 hours in a looking down or hunched over position. This is also a LOW POWER POSE. It does not show confidence. Also, this position puts 700 to 1400 of hours of excessive stress on your neck and cervical spine. Ligaments at the back of your neck get pulled and elongated. These are just very few examples of health problems rising due to everyday poor postures appearing in people as young as 20’s, 30’s. 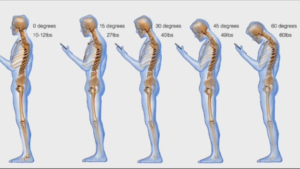 You must notice that when we are using a hand-held device or texting, our head moves forward in looking down position. 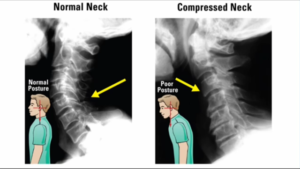 This causes serious damage to our neck, spine and upper shoulders because the long hours overtire the back of the neck, ligaments and muscles trying to hold up our head against the gravity. The increase in burden and stress on the neck is caused by the increasing degrees of forward head tilt is outlined in the picture below. First picture is the normal weights (10-12 lbs) of the head carried by cervical spine. 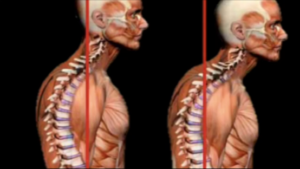 As the head moves forward, the stress weight increases on the neck, damaging the muscles and ligaments and distorting the natural shape of cervical spine. It is extremely hard to get that natural shape back. So preserve it while you can before the damage becomes irreversible. Let’s look at how we can move our bodies and improve our postures every day in the simplest ways to increase the quality of our health the easiest way. 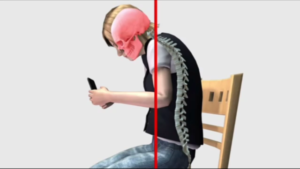 We can’t really avoid our phones now but we can definitely avoid damages to our necks. Apply these quick posture corrections to your daily routine! Move your hunching shoulders back. Keep your chin parallel to the floor. Slide your head back so your ears are on top of your shoulders. Head is in line with spine. If you are sitting on a chair lengthen your spine and make your back straight. If you are texting, bring your phone up to your eye level and rest your elbows on the table.